The accordion has a distinctive sound, dry but capable of beautiful melody, it is an instrument that a lot of European cultures share; its origin seems to be Lombardia, Italy. At one occasion I was very excited to open a book called “Accordion Crimes” but the accordion seemed to be just an excuse for endless mayhem against the characters. Not so this project called Accordion Samurai, by contrast a beautiful project, full of life, hope and even mystery. Masters such as Kepa Junkera and Riccardo Tesi have taught me to love the instrument, and so I was curious to hear this project with the involvement of both. 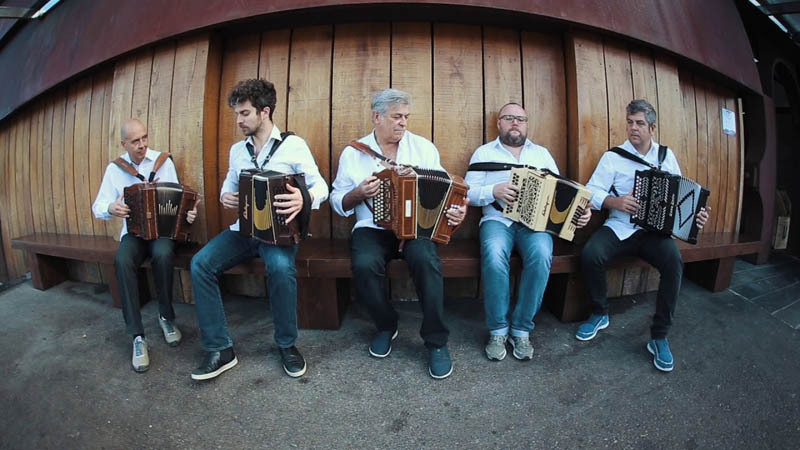 In this the second such project under the Samurai name, Te, five maestros of the squeeze box, five of Europe’s most successful and creative veteran practitioners/composers, come together for a disc that features the diatonic accordion. Full of variety, this disc gives a nice overview of how the instrument is used by some of its most successful exponents, across Europe. 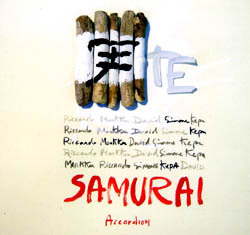 Each of the five musicians provide two tracks: back for their second Samurai: smooth and melodic Riccardo Tesi (Tuscany/Italy), the amazing Markku Lepistö (Finland), David Munnelly (Ireland); and newcomers to the format: Kepa Junkera (Basque Country/Spain) and Simone Bottasso (Northern Italy) which all collaborate on. While the accordion is oft viewed as a humble, ethnic instrument not suitable for either orchestral or popular music across the blinkered Anglosphere, its range of possibilities opened up music across Europe in the 19th century for many peoples who did not have access to classical music. Basques for instance used the accordion in pilgrimages (despite the condemnation of the Church) and most recently have developed competitions for the diatonic (trikitixa in Basque). From this tradition comes Kepa Junkera, who for 30 years has explored every possibility of the instrument. Junkera and Tesi have recorded together since their landmark (but hard to find) 1993 Transeurope Diatonique album with John Kirkpatrick. That’s three of the best, but how about five? On Te, Junkera’s “Gernika” is the most powerful and complex piece. Performed with the vocal group Sorginak, featuring Basque irrintzi (a yell or yodel) and percussion, it’s the only piece that relies on anything other than the diatonic for its main feature. Riccardo Tesi is one of the true masters and his career has included numerous solo and Banditalia efforts among others, Tesi here provides the gems “Sushi Time” and “Tarantella Rouge et Noir”. Back again is Markku Lepistö, known for his work with Värttinä. Lepistö’s bright “January Sun” is the second piece, and “Kuru” is an exceptional, complex reel reminiscent at times of some French Canadian music I’ve heard, particularly La Bottine Souriante. Bottasso’s “Getting Lost in Baghdad” is a highly innovative piece that concludes the 10-tune session. Simone Bottasso is known for his work with his violin-playing brother Nicolò and is a flavorful, innovative player. The disc was recorded at Garate Studio in the Basque Country by Mikel F Krutzaga, and Kaki Arkarazo (ex-Negu Gorriak) two of the most accomplished and well-known music producers in the Basque Country who have hosted and produced artists of many genres from around the world. This is a truly magical place (the interior of which you can see in this video clip). It’s amazing to hear the richness Arkarazo can create out of such a variety of musicians. You can hear some tracks from the album on recent editions of RootsWorld Radio, programs 254, 256 and 257. $21.00 includes postage, US and Canada.